DOUBLE YUM! This is healthy (pumpkin is a fruit) and filling (pumpkin has lots of fiber). Great as a dessert or as a dip with graham crackers! 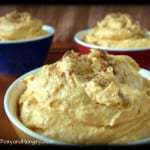 Combine pumpkin, pudding, pumpkin pie spice, and vanilla. Mix well. Refrigerate for an hour or more. Serve with graham crackers or simply eat with a spoon!